A Southampton scientist has worked with Alzheimer’s Research UK, the UK’s leading dementia research charity, to create the first ever virtual lab tour designed to help the public understand how new dementia treatments are developed. The Lab http://www.dementialab.org/ is launched today (21 June) and takes visitors on an interactive journey through photo-realistic laboratory and hospital environments to learn about how research into diseases like Alzheimer’s takes place. Over 820,000 people in the UK are living with dementia, including more than 2,000 people in Southampton alone. With over 40% of the UK population knowing someone close with dementia, and support for Alzheimer’s Research UK on the rise, interest in dementia science has never been higher. Alzheimer’s Research UK funds more than £20m of dementia research across the UK – including almost a million pounds at the University of Southampton - and is a leading commentator on new dementia research findings. A fluorescent image of the brain taken by Dr Cheryl Hawkes, a dementia scientist at the University of Southampton, has been used as part of The Lab to help people understand the importance of looking at proteins in the brain during Alzheimer’s. 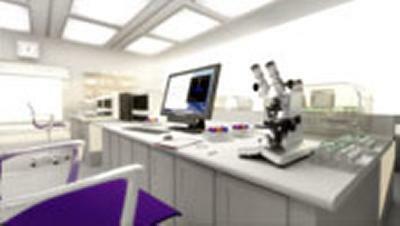 The Lab allows visitors to travel through three main research areas at the scroll of a mouse. Starting with a basic research laboratory, visitors can watch videos and slideshows about how research is funded, and how unravelling the basics of diseases like Alzheimer’s and frontotemporal dementia can help in the search for answers. Visitors then fly through the roof of the lab into a second environment, where they can learn about more clinical research such as brain scans, blood tests and how research using animals plays a crucial part in the process. The final stage of the journey takes visitors into a waiting room, with videos and posters explaining how new treatments are tested in people. The Lab also allows visitors to read the latest news stories about research in each of these areas. Visitors can connect using Facebook to share their visit with their friends and make The Lab experience more personally tailored to them.